21 May 2015 Washington D.C. Ever ready to lift the intellectual level of debate in the Senate, a Democrat resorted to the Internet’s emoji-like “shruggie” symbol to describe the response to Obamcare by Senate Republicans. 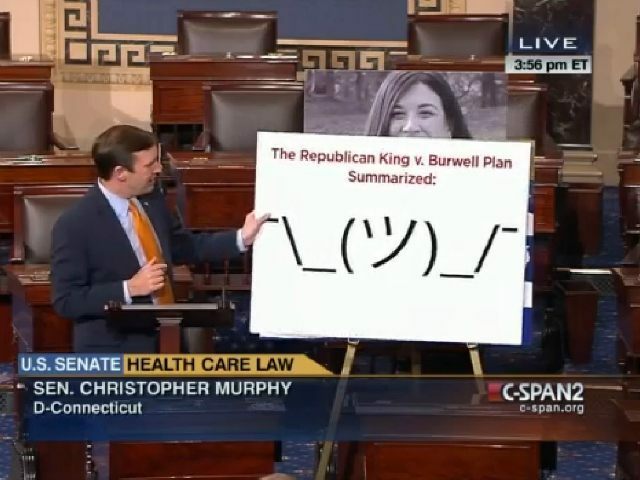 Murphy is referring to King v Burwell, a case currently before the U.S. Supreme Court. The case is challenging an IRS regulation imposed under the Affordable Care Act, better known as Obamacare, that allows subsidies on both state and federally-established health insurance exchanges. The case also claims that the IRS regulation violates the plain language of the law enacted by Congress, which gave states the choice to either set up such exchanges themselves or stay out of the program. For his part, Murphy was sure that the Supreme Court would side with Obama. “There’s no other way to read the Affordable Care Act other than to believe that subsidies go to both state and federal exchanges,” he said. But, if Murphy was concerned about a lack of a plan, it seems that he should be more concerned with the fact that President Obama himself has said he’s made no plan in case the court rules against his signature take over of the nation’s health care system. In fact, early in March, Obama was defiant about not having a “Plan B” in case his law was shot down by the Supreme Court. It may seem shocking that the president has no backup plan in case his health care law fails to pass—until one considers the possibility that he may be planning to simply forge ahead and ignore whatever the court decides. On Thursday, Wyoming’s Republican Sen. John Barrasso pointed out to Murphy that it was Obama, not the GOP, that is just shrugging off making any plans. “[Murphy] said that the Republicans don’t have a plan. Where’s the president’s plan? He’s the guy that made the mess,” Barrasso said.